Fighting deep underwater approval ratings heading into his 2019 reelection campaign, Kentucky Republican Governor Matt Bevin announced last week that his running mate will not be Lieutenant Governor Jenean Hampton but instead state Senator Ralph Alvarado. 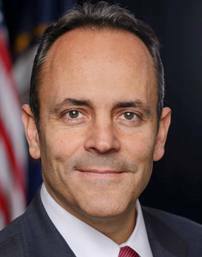 Bevin recorded just a 34 percent approval rating in Morning Consult’s latest survey conducted in the fourth quarter of 2018 – tied for fifth lowest in the country. His net approval was -17 points. Lieutenant Governor Hampton did not signal any desire to get off the ticket, nor any expectation that she would be asked to remain, suggesting Governor Bevin may simply feel the need to shake up the race after a first term in which his administration sparked notable divisions in the education sector (allowing charter schools and battling growing pension issues) and with unions (signing a right-to-work law) plus backed an abortion law that was struck down by a federal judge last fall. Bevin’s decision to choose another running mate is not unusual, however, during the short political history since the Commonwealth’s constitution was amended in 1992 to permit governors to run for a second term. [That amendment also changed the election of lieutenant governors from appearing on a separate ballot to joining the governor on a single party slate]. Democrat Paul Patton was the first Kentucky governor permitted to seek reelection in 1999 after the new amendment with his 1995 running mate, Lieutenant Governor Steve Henry. Patton and Henry built on their 2.2-point win in 1995 against attorney Larry Forgy’s ticket to record a 38.5-point win against Peppy Martin’s. The next three incumbents, however, switched up their reelection running mates. In 2007, there was little suspense when Republican Ernie Fletcher chose another running mate as Lieutenant Governor Steve Pence announced more than a year before the election that he would not join the ticket. Pence was an outspoken critic of Fletcher particularly during the last two years of his governorship. [Note: Pence was not Fletcher’s first choice for lieutenant governor in the first instance in 2003. His initial running mate, attorney and Mitch McConnell aide Hunter Bates, had to withdraw after a judge ruled he did not meet residency requirements for the office]. Instead, Fletcher chose businessman Robbie Rudolph for his 2007 campaign. Rudolph was Rebecca Jackson’s running mate in 2003 in her failed bid to win the GOP gubernatorial nomination against Fletcher. In November, the Fletcher ticket suffered a 17.4-point loss to former lieutenant governor, attorney general, and state legislator Steve Beshear. Four years later, Governor Beshear also switched out his party’s nominee for lieutenant governor. In 2007, Beshear tapped state Senator Daniel Mongiardo but the lieutenant governor opted to run for the U.S. Senate in 2010 forcing the governor to find another running mate. [Mongiardo lost the Democratic primary to state Attorney General Jack Conway]. In July of 2009, Beshear announced his pick for lieutenant governor would be Louisville Mayor Jerry Abramson. Beshear and Abramson coasted to a 20.4-point victory over Republican state Senator David Williams’ ticket. Bevin is poised to face a strong Democratic challenger this cycle with three bona fide politicians running for governor: state Attorney General Andy Beshear, state House Minority Leader Rocky Adkins, and former state Auditor Adam Edelen. Bevin will face state Representative Robert Goforth and William Woods in the GOP primary with the filing deadline for the 2019 race ending Tuesday, January 29th. Previous: Will a Westerner Finally Land on a Democratic Presidential Ticket in 2020? Be the first to comment on "Bevin Brings In New Blood"